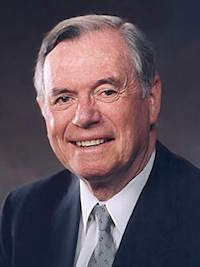 Wayne M. Hancock was sustained as a General Authority of The Church of Jesus Christ of Latter-day Saints and served as a member of the Second Quorum of the Seventy from April 1997 to October 2001. He also served in the Church as a stake president, bishop, high councilor, mission president’s counselor, and president of the Utah Provo Mission. He was born in Safford, Arizona, on July 16, 1931, and raised in Glendale, California. He earned his bachelor’s degree from Brigham Young University and a ljuris doctorate from the University of Arizona. After his graduation, he entered the U.S. Air Force's Judge Advocate General Corps and was stationed in Munich, Germany, for three years. Upon finishing his Air Force tour of duty in 1960 at Hill Air Force Base in Utah, he practiced law for six years in Phoenix, Arizona. He then worked in Midland, Michigan, for twenty-seven years with the Dow Chemical Company and lived for a several years in Switzerland and Italy as vice president and general counsel of Dow Chemical Europe. He retired as vice president and general counsel. Hancock and his wife, Connie, are the parents of eight children. This page was last edited on 2 June 2017, at 16:38.